The popular ODM will show off new designs at next week's Computex 2017 in an attempt to boost revenue for the remainder of this year. According to DigiTimes, Taiwanese manufacturer Clevo has recorded a sharp drop in sales during the Q1 2017 period. Profits sit at just $1.247 million USD to represent a year-over-year drop of 46.15 percent. Overall revenue has also fallen by 8.04 percent YoY. Clevo is pointing its finger at the weakening Taiwanese Dollar as a major contributor to the slumping sales. Nonetheless, the company is expecting to recover throughout the second half of this year when its new notebooks will launch to more users internationally. New multimedia professional notebooks are also set to appear at Computex 2017 later this month. 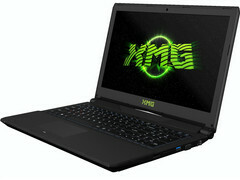 Clevo is a major player in the laptop ODM market as it sources original barebones designs to resellers such as XMG for the European market and Eurocom for the North American market. Many of its designs are some of the most versatile in the notebook market with the ability to accept MXM 3.0 GPUs, LGA 1151 desktop CPUs, multiple storage bays, and easily serviceable components all in a notebook.